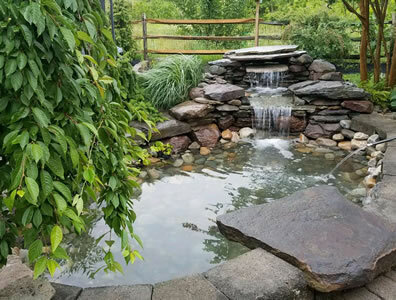 We can help you get your pond or water garden to look amazing as you prepare to sell your home. We provide professional pond cleaning, pond repair, water garden, waterfall, fountain, and general pond maintenance. We can get even the most neglected ponds back in shape. Full Service Areas Covering: Maryland, Washington DC, Delaware and Pennsylvania. Professional pond cleaning, maintenance and repairs by our experienced team of pond technicians. Don't forget about the pond or water garden on the property as you prepare to stage or showcase your home or business. As you are preparing to sell your home don't forget to evaluate whether your pond is going to be a selling point or a hinderance to selling your home. If your pond needs repairs or maintenance, give us a call and we would be happy to come out and give you a free estimate. We can replace pond liners, pumps, filters, as well as other pond elements. Choose from a huge selection of pond supplies, including pond pumps, pond filters, thermometers, uv lights, pond filters, accent lighting, pond liners, pond kits, pond deicers, water treatments, waterfall tanks, pond fountains, aquatic plants, fish food, and more. We have everything you need to get your pond ready as you prepare to sell your home. A beautiful backyard pond could make your home standout and sell faster. Ponds Cleaned and Repaired / General Pond Maintenance: Our cleaning services include waste buildup and debris removal, cleaning of the pump and intake screen, equipment check for pumps and filteration systems, linings checked, water conditioning, algae control, circulation and filtration equipment restarted and consultation services, snake removal, and more depending on the time of year, size and age of pond. We can also prune, clean or remove or replace aquatic plants as needed. Make your pond or water garden an asset to potential home buyers. A well maintained pond can be a big selling point. Give us a call to set up a personal consultation at your location.